HAPPY 2nd BIRTHDAY TO BUGABOO! If not, make sure you start at the Bug Blog here. 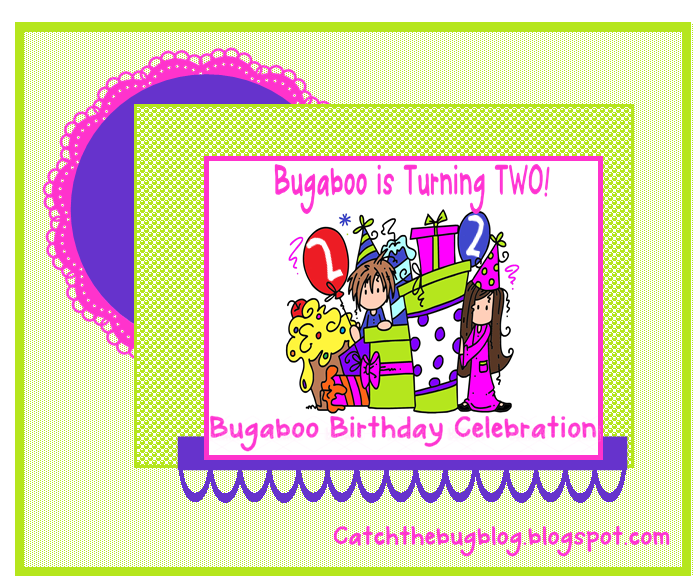 So, to celebrate Bugaboo’s 2nd Birthday, not only are we doing this fun blog hop, but we’ve got a great Birthday Themed challenge for you today! Wanna know what’s up for grabs for the hop and for the challenges? The Grand Prize Winner who completes the blog hop, plays along with the regular challenge (Saturday’s Challenge) and ALL the mini challenges will get 1 free set per month for all of 2012. Second Place Prize - One randomly selected entrant that has participated in all of the mini challenges will get to be a Bugaboo Guest Design for February, March & April PLUS receice the New Release Set for the week. Be sure to check out the THE BUG BLOG for all the deets, because there’s LOTS MORE WINNIN’ to happen this week!!! SO MAKE SURE TO COMMENT ON EACH STOP ALONG THE WAY because each design team member is pickin’ ONE winner from the people who leave comments to WIN the image they used on their Birthday project! ADORABLE card Lori! What a sweet little birthday boy!! Such a sweet card...almost reminds me of the Peanuts character. I love he added little accents of the buttons. nice card! Happy Birthday Bugaboo! This is just too cute! Love the adorable image you used! Great layout with the buttons! Oh, how cute! I adore that AKV image! Super! great card. another good boy card! Oh now isn't this a sweetie of a card!! Love your image. Great masculine card is right. Lori fabulous card thanks so much for all you do! 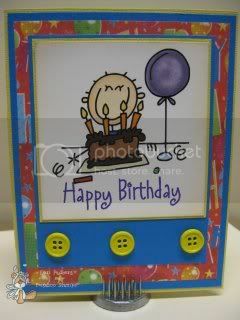 Cute card - fun image! Super cute, Lori! Love the buttons! A cutie for any age! 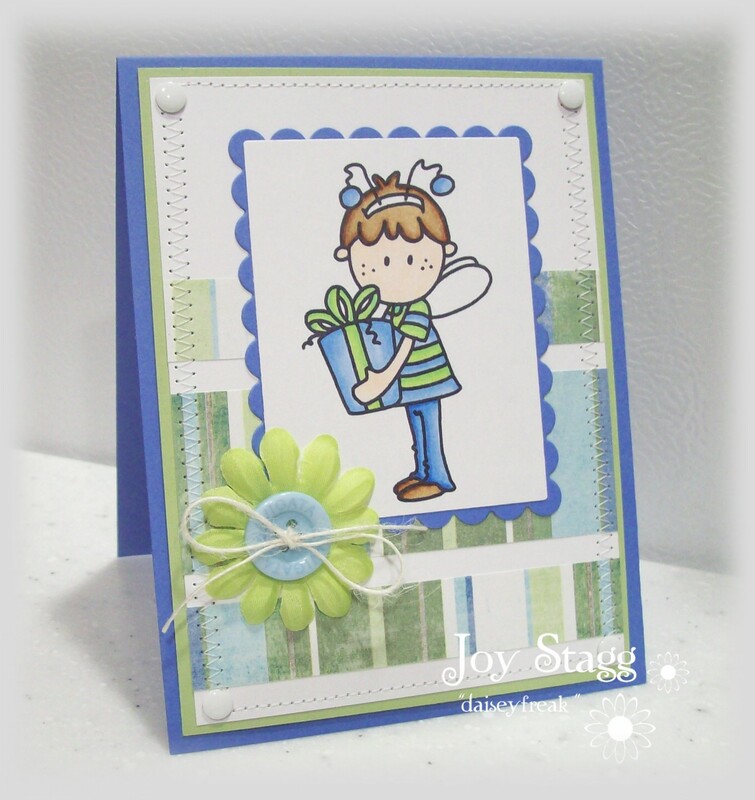 Beautiful card Lori love the colours and your gorgeous design,yummy buttons too. A perfect kids card. Love everthing about it. sweet card Lori! love the colors and i love the buttons!!! Great card, especially the addition of buttons. Awww...this is just so sweet!!! What a fun creation!!! Such a cute bright card. Sorry it took so long to get by today. It has been a great hop and you all have done a fantastic job. Adorable card. The image and colors are so whimsicle. What a sweet card! Love the vibrant colours! This is just so cute Lori, fabulous and bright birthday card, I love it! Love you card and such a cute digi stamp! A great kids card. Love the addition of the buttons! Such vibrant colors! Love the buttons and the bright colors! Very festive! super sweet! love the card! What a sweetie! Love it! Love that smile, great Birthday card!